Twill Cargo Pants: The ultimate in comfort and durability. Patch trouser pockets, elastic waist, side pockets at the knee, cropped length. In Khaki, washable, #6118, $52. Shown with Roller Coaster Tee in a lightweight jersey knit, #5171, $42. 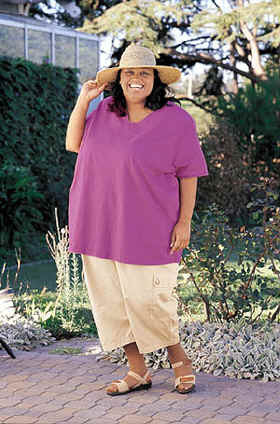 All clothing available in sizes 1 to 4 (16–44). Rio Swimsuit: This tank suit is basic black with a colorful rainbow design. Supportive straps, a soft inset bra, good overall coverage. Hand washable nylon/spandex, #5274, $62. 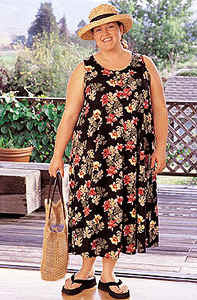 Aloha Sundress: In a cotton/rayon blend with a nice A-line shape and stitched-down pockets. Washable, #7089, $68. Cool Blue Ensemble: Made in Bali from a shimmering rayon twill that is hand batiked and then pieced together using an assortment of complementary prints. Pants, #9058, $62; blouse (shell buttons), #9056, $68. Washable. 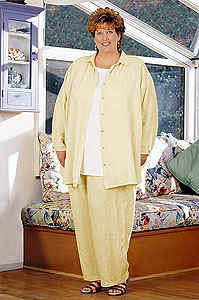 Linen Ensemble: Featherweight linen wide-leg pants have an elastic waistband and side-seam pockets. Available in all their seasonal colors, washable, #6072, $58. 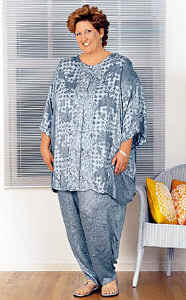 Shown with linen tank, #5258, $44, and linen big shirt (shirttail hem, button closure on the sleeve), #5287, $68.